The two parts of the north aisle were added in 1846 and 1878 together with the Priest’s and Choir Vestries. 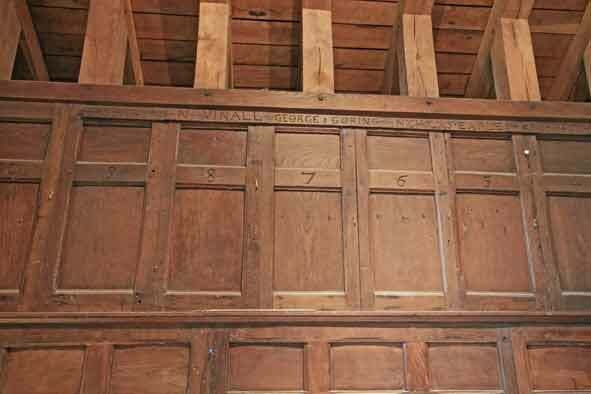 The current pews were added at this time and the ends of the old pews (each of which contained the name of the main occupier) were used to line the walls of the Priest’s Vestry and now provide a memorial to parishioners of the time. The large east window is a memorial to the Blencowe and Tillard families, who were/are patrons of the Living. To the right of the east window is a plaque containing details of Rectors dating back to Robert de Purleigh in 1256, and many of these clergy are buried in the churchyard. St John's Chapel in the northeast corner was added in 1979 using an oak screen from the redundant church of St. James in Camberwell, London. 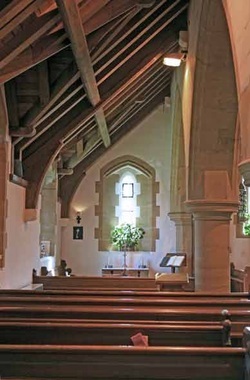 Within the chapel on the east wall is a light next to a small safe or Aumbry (which is a cabinet used to store items associated with Communion) that is used for the Reserved Sacrament of Bread and Wine. The safe (which is a modern addition) has a door depicting keys, which are the emblem of St Peter. In earlier years the sacrament was reserved in a tabernacle that formed part of a wooden screen behind the altar, but this was removed shortly after the end of World War II. The Choir Vestry at the western end of the aisle was used to create a kitchen in 2015, from where we serve refreshments after service and provide meals for our monthly lunch club. The most recent addition to the north aisle is the new stained glass east window in St. John's Chapel, dedicated to the memory of Eddie Matthias, former rector of Chailey. It was installed in 2013, and a dedication concert was held to commemorate the event.